I know, I know I had mentioned in my earlier POST that my MINI GIVEAWAY will be up after my FIRST GIVEAWAY but I couldn't control myself. lol. This happens to most of us right? 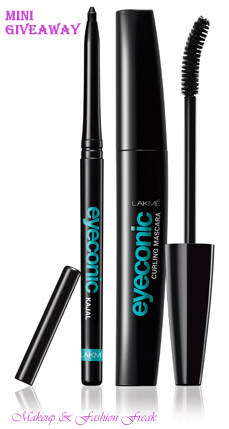 Grab the opportunity to WIN newly launched Lakmé Eyeconic Kajal & Curling Mascara. The GIVEAWAY is open for INDIAN residents only and will END on 14th October (its my brother's birthday). There is only one winner. The winner will be picked through random.org. There are three simple rules which are MANDATORY. -You have to be a public follower (GFC) of this blog on the right. -Share this post on your Facebook wall, tagging 5 friends (make it public so that I can see it). To enter, just leave a comment below. Copy & paste this. P.S.- THIS IS NOT A SPONSORED GIVEAWAY.